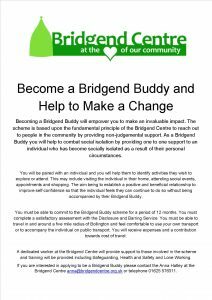 The Bridgend Buddies project is a befriending service aimed at combatting isolation in the Community. The scheme is based upon the fundamental principle of the Bridgend Centre to reach out to people in the community by providing non-judgemental support. We will be teaming up volunteer ‘buddies’ with an individual who has become socially isolated as a result of their personal circumstances. We are currently recruiting volunteers to the role of Buddy and the key attribute we are looking for is a person who can provide non-judgemental support in a caring and respectful way. If you know someone who may be interested in doing this role in the Bollington area or someone who might like to be befriended, please do contact us on 01625 576311 or info@bridgendcentre.org.uk.